Dice games have a special place in my heart. I remember being about 13 and finding out about Dungeons & Dragons. Sure enough, one of my buddies had an older brother and he passed his books down to us. The first time I saw polyhedrals, I was in love. The awesome shapes, the new numbers that went beyond six, and the endless possibilities drew me in right away. Dice are everything that’s fun about life in one little package: “The Slings and Arrows of outrageous Fortune”. Anytime a game uses dice rolling as its main mechanism, it catches my interest. Sure, I like rolling dice in Talisman, but I LOVE rolling dice in Ra: The Dice Game or Shanghaien because it really drives those games. Such is the focus of Steve Finn’s Capo dei Capi. In this game, two little six-siders are used in a really clever way to create a drastically underrated dice-rolling experience. At the heart, this is a push-your-luck game combined with area majority. On your turn, you roll the black six-sided die and the white six-sided die until you choose to stop or you bust out. Stopping voluntarily gives you everything you earned that turn while busting gives you nothing. The colors of the dice are representative of the 2 sides of town comprised of a 1, 2, and 3 in each color. The dice are going to tell you if you get to place an Influence token on an area card, place a bribe, extort the mayor, or play a Value cube to increase the value of an area card. The game comes with a wonderful rulebook that outlines all the possible actions. At first glance, I was a bit worried because the rules seemed thick for a game that advertised 15-20 minutes of length. However, Dr. Finn did a great job and it’s mostly clear. Also in the box are 2 player aids for easy reference. Dr. Finn did an awesome job on those aids because you won’t ever need to reference the rulebook once you’ve read it. They tell you everything you need to know. Like a lot of games, one big rule error costs Capo dei Capi a point. Final score – 4 points. I like that the mayor tokens have a picture of the mayor on them. The influence tokens are pretty vanilla, but they do the job. 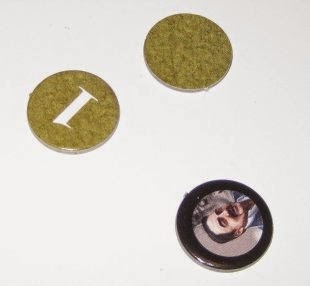 I do wish the bribe tokens had a bit more pizzazz but they are perfectly functional. I’ll still deduct just a bit for the lack of any kind of artwork on theses, but only a bit because they do the job. The cubes are cubes so not much to say there. Same thing with the pawns. 2-players – This is a 2-player only game. For me that’s a bonus because most of my gaming is 2-player. If you don’t get a lot of 2-player opportunities that may hinder your desire to own this one. I wouldn’t exactly call it confrontational, but there is some direct hindrance of your opponent. Again, that’s a plus to me. If you want multiplayer solitaire, look elsewhere. Push your luck – Ultimately, this game is all about pushing your luck. You can roll the dice as many times as you want as long as you don’t bust. I’ve seen short turns and really long turns. 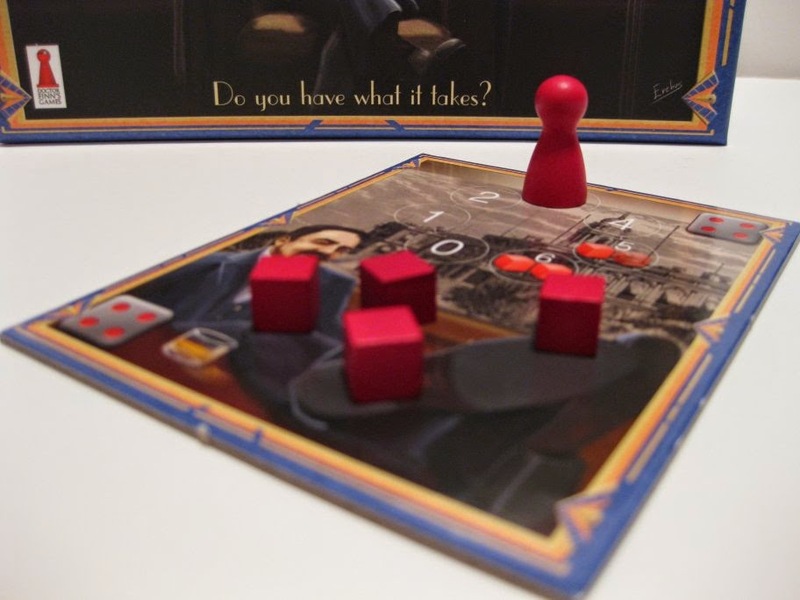 If you like the tension of push-your-luck games then this one will deliver. It’s imperative you push as hard as you can to try and get and edge because falling behind can be deadly. Length – This is a pretty short game so a lot can happen very quickly. Depending on how the dice roll, a game can be either drawn out or short. You really don’t know how much time you have so you don’t want to get left behind. You have some control over this by choosing how hard to push on a turn. Sure, you might bust but you have ways around that. Typically, you are looking at 15-20 minutes per game making this ideal for a best 2-out-of-3 match. Mayor Tokens – Any game with two six-sided dice will always have a lot of 4’s rolled. Any 4 activates the Mayor card and usually gives you Mayor tokens. Those tokens allow you to do a bunch of things such as move Influence tokens, put tokens directly on cards, re-roll your dice, or make your opponent re-roll. It turns out that managing these tokens is absolutely integral to playing well. Since you have a choice to use these on every roll you have to use them judiciously and know when to spend them. You don’t want to run out because then you are left to chance. You also don’t want to have them sitting around because that means you aren’t getting the benefits they give. Roll again! – One of the best rules surrounding the Mayor tokens is that anytime you spend one, you MUST roll again. So even if you use them to stave off a potential bust, you still have to roll again and may get bit anyway. I like that the game gives you options but makes you pay a bit of a price for doing so. It’s a really nice touch that helps mitigate their strength. Doubles – The first time you roll doubles, the Hitman comes and visits you. Roll doubles again, and you bust. You can pay a mayor token to keep him away which is awesome because rolling doubles goes from good to amazing. You really do want to be able to roll doubles repeatedly so keep those Mayor tokens handy. Extortion – Any time you roll a 4, some type of Mayor action happens. Generally this includes putting Value cubes on the Mayor and moving the Extortion marker up the card. If you can get it to 5 and end your turn without busting, you get half the cubes on the card. If you get it to 6, you get all the cubes. Naturally, this can add up to a lot of victory points so you want to maximize this if possible. You can spend Mayor tokens to increase the Extortion track to get you closer to those points which is often a great use of the tokens. But keep in mind, you will have to roll again. Downtime – There’s really none. When it’s your opponent’s turn, you will still want to pay attention because you can always backstab your opponent for 1 Mayor token and make them re-roll. You’ll want to pay attention because timing that re-roll can be of major importance. At most, each player’s turn will take 2 or 3 minutes. Value cubes – If there’s one gotcha to this game, it’s the Value cubes. When placed on the Area cards, they increase the value of that card. That’s a great thing because you can beef up your score by winning a card with a lot of cubes. Unfortunately, you can sometimes get stuck putting them in places you don’t want such as when you are losing badly in an Area. While you can move Influence tokens around, you can’t affect where the Value cubes end up very easily. If there was a way to change that, I’d have zero complaints at all. Area Majority – Behind all this dice-rolling and push-your-luck is the main crux of the game. The whole point of the Influence and Bribe tokens is to win the card. You do this by having the highest score on each card. It may seem like dumb luck to get those tokens there, but you can always spend Mayor tokens to either put tokens directly on the card or move them around. You can even do both to really make sure you get the tokens you want on the cards you want. This adds even more stress on the Mayor tokens by giving you more options. This is where those Value cubes can bite you because you can have a card get really built up with no way to get tokens on it. Learning curve – You might think this game is pretty self-explanatory and I would agree with one exception: the Mayor tokens. The game really revolves around using these and maximizing what you do with these. Our first couple games made it seem like these were a waste so we thought we could tighten it up by reducing the starting number. That forced us to learn how to use them effectively which made them all the more valuable. Taking it back to the recommended number really opened up a ton of possibilities we hadn’t seen before. While anyone can roll dice, it’s using the Mayor tokens to massage the game in the direction you want that takes a bit of learning to master. And since it’s a dice game and every situation will be different, you will be constantly forced to adapt how you use the Mayor tokens from game to game. This is one of the game’s finest points. Final Score – 9.5 out of 10. I’ll knock a bit off for the Value cubes, but only a bit. It’s definitely not a game-breaker, but it’s the one place you don’t have much control at all. Otherwise, I love the gameplay. Overall – This is a great game overall. A small knock on the components for the lackluster tokens and another on the Value cubes in gameplay takes 1 point. It loses another for the rules omission about the Value cube scoring, but I am nitpicking just a bit. That brings the overall score to 18 out of 20. On the BGG scale I’ll rate it 8 out of 10. It’s a very good game that I want to play and won’t turn down. It’s no secret that I adore Dr. Finn’s first game, Biblios. It turns out that I love this one as well. Truth be told, I did not expect that from my first read-through of the rules. It seemed much more complex than it turned out to be. This is really a simple game with a lot of choices and opportunities to alter your fate. The play time is perfect for the game because it neither outstays its welcome nor ends too quickly. In fact, I’d compare this to Ra: The Dice Game as a great 2-player dice game. When it runs a bit longer, the strategy gets deeper. When it’s short, it’s a race. You have some control over that, but you generally need to react to what’s happening in the pace of the game. This game has flown under the radar and it shouldn’t. It’s a real gem in the dice-rolling category that uses a really inventive roll resolution mechanism to provide both choices and some rigidity to the system. Once again, Dr. Finn has hit a home run although this one hasn’t gotten the attention it deserves. It’s time that more people get a look so it can get the same recognition as Biblios. I don’t think it’s quite as good as that masterpiece, but this one is pretty awesome in a different way. I highly recommend you check this game out. Yup, I’m an unapologetic Dr. Finn fanboy. And totally proud of it.